A recent study by Transparency Market Research (TMR) offers insights into various strategies that players within the global veterinary endoscopes market adopt to gain competitive edge. Companies such as Harvard Bioscience Infiniti Medical, Olympus Corporation, Fujifilm Holdings Corporation, KARL STORZ SE & Co. KG, Richard Wolf GmbH, STERIS plc, ESS, Inc., Jorgen Kruuse A/S, and HOYA Corporation (PENTAX Medical) are some of the key players operating in the global market. In order to gain a competitive edge, these companies majorly rely on strategic collaborations, mergers and acquisitions, product launches, and research and development. Besides these, investment in innovations form an important inclusion in their strategies aimed at giving considerable boost to their ongoing business. According to TMR, the global veterinary endoscopes market is likely to reach US$728.1 mn by the end of 2025, as against US$405.1 mn in 2016. Between 2017 and 2025, the global veterinary endoscopes market is likely to show a CAGR of 6.7%. In terms of animal, the demand for veterinary endoscopes is likely to be the highest from the companion animal segment. Among end users, hospitals beat the veterinary clinics segment to emerge at the market’s fore. Regionally, the global veterinary endoscopes market was led by North America in 2016. However, during the forecast period, lucrative opportunities witnessed in Asia Pacific is likely to be higher. The healthcare sector has showcased several breakthroughs in the recent past. From finding cure for chronic ailments to dealing with the looming patent expiries, the research and development activities in this sector has been astounding. Besides launch of myriad novel therapeutics aimed at offering improved human health, developments in veterinary medical science have been commendable as well. The world witnessed the launch of several diagnostic and treatment methods aimed at offering advanced healthcare for animals. In addition, several cutting-edge medical devices were launched in the field. Among these were the novel endoscopic techniques, developed to offer pets less painful and minimally-invasive alternatives to traditional open surgery. With people willing to spend on effective treatment for their pets, the demand for veterinary endoscopes has surged significantly in the last few years. Given the scenario, the rising adoption of pets and domestication of animals will provide considerable boost to the global veterinary endoscopes market. Furthermore, animal protection laws have become increasingly stringent across the world. This is aimed at curbing atrocities meted on animals. As a matter of fact, these laws also gave impetus to veterinary treatments and medications, which has created newer growth avenues for the global veterinary endoscopes market. Also strong involvement of various non-government organizations in animal welfare and healthcare has upped the demand for effective veterinary treatment across the world. Spurred by steps taken by governments to curb animal cruelty and conserve wildlife, the global veterinary endoscopes market will find lucrative growth opportunities in the coming years. The recent advancements in veterinary endoscopy offers improved view of animal organs. Because of these advancements, faster recovery has become possible. Besides this, veterinary endoscopes enable accessing the other inaccessible organs within an animal body. While these factors will enable the market register strong growth in the coming years, limited penetration in emerging and underdeveloped nations will slacken its pace of growth to a limit. 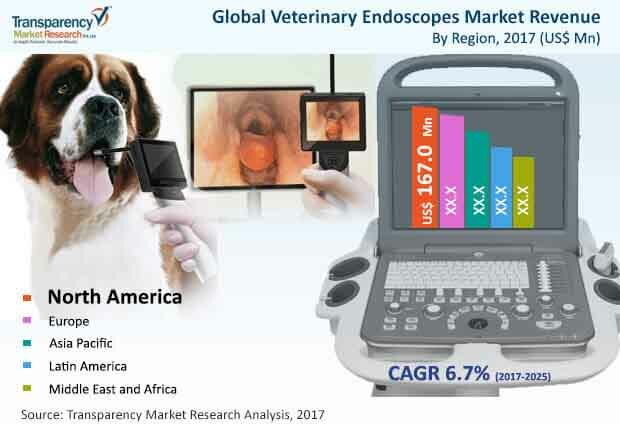 Furthermore, inadequate knowledge about veterinary endoscope in these countries may also create hindrances for the market, besides cost constraint. The high cost of these devices will also act as a negative factor, adversely affecting the global veterinary endoscope market’s growth prospects.